June 1-25 – Join us for 16 full length plays completely improvised in the style of low budget Sci-Fi movies and Creature Features that were famous and infamous in the 20th century. Watch as the Modjeska Unscripted cast creates monsters and aliens that attack amorous teenagers, frighten housewives, reek havoc on small towns and threaten large cities. Then watch as the heroes and heroines save the day! Full of outlandish characters, campy dialogue, and ridiculous plot lines, these plays pay homage to the Saturday afternoon matinees “you love to hate”. 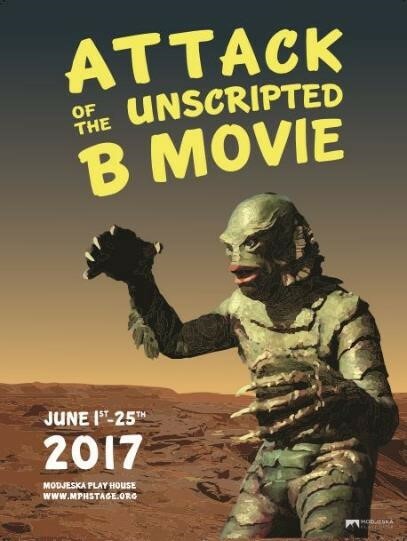 Based on your suggestions, each show is totally unscripted, created on the spot, and like many B Movies, only performed once before it’s gone! Times: Thursday – Saturday at 8 p.m., Sunday at 5 p.m.